Sundar is my friend. He was bugging me to write a blog post on him. He also added that I should praise him in my Blog. I asked him what I should write about him. He did not have an answer to that question. I wanted to make him happy and hence decided to collect details about him. That is when I discovered that Sundar had actually played with Sachin Tendulkar before the 2003 world cup. I learnt of this secret from Sundar's diary. He has never told me this secret all this while. When I read the incident about the manner in which he shocked Sachin with a blinder of a catch, I had goose pimples. My friend Sundar is so grounded that he never opened this thing with me. He is such a humble character. It was the 15th of January 2003. Sundar led a team of 11 players. The name of the team was " Chennai Dumeel Dhamaka". This team took on the mighty Indian cricket team for a bet match of Rs 200. Sundar bowled the first ball of the match to Sachin. Sachin hit a beautiful shot through the covers. But little did Sachin realise that Sundar would dive like Superman and catch the ball out of thin air. That catch shocked the entire cricket team. Ganguly immediately wanted to drop Dinesh Mongia and replace him with Sundar for the world cup team. But Sundar declined that offer because he wanted to watch Annamalai serial on Sun TV. When I read about this incident, my respect for Sundar grew so much that I ended up burping. 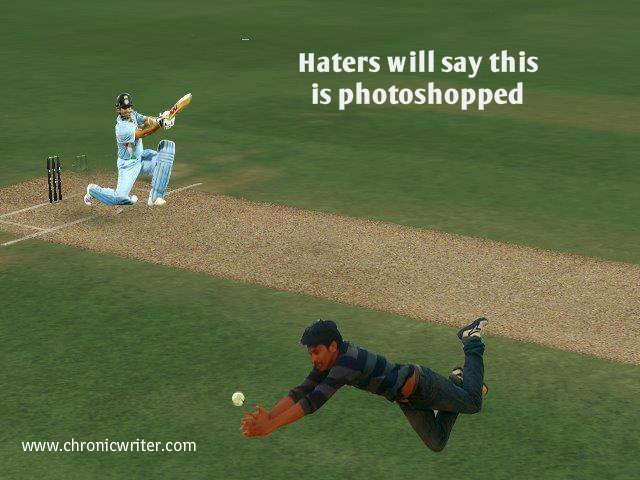 Sundar also has a photograph of the catch that he took of his own bowling to remove Sachin. I know that there will be criticizers who would say that the picture is photoshopped. But I don't care, because I believe my friend Sundar than anyone else in this world. Note to Sundar : Dai! I kept my word. I have finally blogged about you.